T-seals are engineered to retrofit O-Rings in either static or for their intended use in reciprocating applications. One of the main advantages of the T-seal is that the T base construction is highly resistant to spiraling during installation and operation. 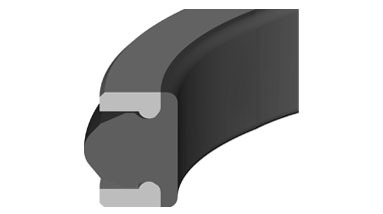 T-seals consist of a basic T shaped elastomer, typically flanked by two specially fitted backup rings. Since they're designed to retrofit O-Ring grooves, T-seals are available in many different widths depending on the type of O-Ring or O-Ring/backup combination that they are replacing. To accommodate different types of mediums and internal pressures, there are several different materials available for both the elastomer T portion and the flanked back-up rings. You can consult our material guide or contact High Performance Seals to better determine what material is best suited for your application.